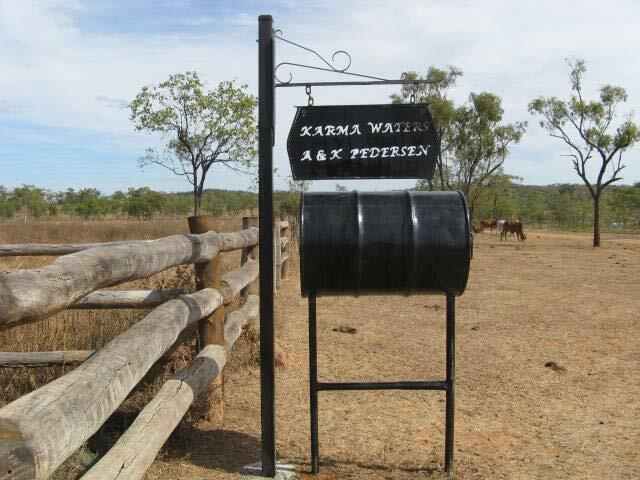 Karma Waters is 200km North West of Cairns on the northern side of the Mitchell River. The property is approximately 45000 hectares, made up of shaly or greywacke ridges. Access is via the Mulligan highway, 25km west of Mt. Carbine and along Hurricane road and Karma Waters road. The block north (approximately 19700h) of the St George was won in a ballot in 1989 which is very hilly country and then we purchased an Occupation Licence from Fred Burdell in 1991. The block we bought from Nychum is approximately 10 km wide and enjoys a 50 km frontage to the Mitchell River which is where the homestead is situated. Both blocks were bare of infrastructure and cattle. View our adjoining properties map. After owning the two blocks we needed a name for both so we looked up ‘lucky’ in the Thesaurus and one of the words was Karma and as the beautiful Mitchell River and St George are a part of the property we named the cattle station Karma Waters. Native Title determination was reached in 1998 to allow for an upgrade to an all-purpose perpetual lease and gave security of tenure for the long term viability of the property. This agreement was the first on pastoral lands in Australia negotiated with the Traditional Owners Western Yalanji in good faith even though it took 7 years to complete.